As educators we need to ensure that our students are interacting with individuals and organizations that are qualified and who demonstrate competency in their subject. Lectures from a bunch of middle-age men upset with the state of today’s society is as far from such a standard as one can get. Or it provides them the perfect opportunity to do the research (in this case it would not take much) to verify if what they are being told it true or not. It like educating for Media Literacy. The kids need to be able to discern between reality and “smoke and mirrors” in everything they encounter in the world. Logic is what is missing. No argument here, but remember that these kids are in middle school and their ability to discern fact from fiction will also depend on the competency of their instructor. Just imagine what these guys look like to young-impressionable minds. Whether the statement itself is accurate or not, I don’t believe the article actually says that the students were told this. It seems to me that it’s something said to the paper itself and it’s nothing new that the Sons of Confederate Veterans feel this way. Sarah, — You are correct in pointing this out. We don’t in fact know what was said, but I’ve read too many articles where it stated explicitly that the SCV addressed students on issues having to do with slavery and race. These guys don’t waste opportunities to pass on their overly simplistic and self-serving view of the past to a gullible audience whether it’s the general public or school kids. Hi John, — I caught part of the show also. It doesn’t take much for Gary to get upset with people like that. I didn’t hear him say that the war wasn’t about slavery, but, as you referenced, that secession would only have led to two democracies so what’s the big deal. If you are interested in following up on how northerners conceived of a war for Union I highly recommend Russell McClintock’s _Lincoln and the Decision for War: The Northern Response to Secession_ (UNC Press, 2008). Teachers must be wary of inviting into their fold hobbyists who pose as historians and it behooves all of us to refrain from confusing entertainment with education. Couldn’t have said it any better, Mannie. I attended a program like this the other day. I heard a reenactor tell 8th grade students the reason the men of the North fought, “wasn’t to end slavery, or to keep the Union together. It was to impress girls.” Wow! Really? Thanks for trying to make a connection with a bunch of 8th graders, but seriously?! Student reenactments can be great teaching tools; they appeal to different learning styles that the classroom setting may miss, they are very hands-on, and they allow students to empathize with the people of the past. But in this specific instance, I hope the kids were not paying attention. I agree with entirely that a well-trained reenactor can be very educational and may be able to share a perspective that is impossible to introduce in the classroom. My point was simply that we seem to assume that if someone is wearing a uniform that they have something to say that has value. I’ve read too many of these nightmare scenarios and advise teachers to take the necessary steps to ensure that they have a reliable living historian for their students. I’ve been toying with the idea of finding an African-American Civil War reenactor to come visit my summer school (college survey) class. I’ll be damned if I’ll let some neo-Confederate visit but someone who knows the history of black Union troops would be different. Should we be teaching children anything about the Civil War in middle school? I have children and nephews this age and I ask them what they are taught about the Civil War. The remarks are interesting. They are at an age where they believe what people in positions of authority tell them. They should be taking another math class, not history. Currently the history of the Civil War is being challanged but do yall have it right this time? The guys writing the books in the past were suppose to be the best and brightest. 100 years from now they will be calling present scholarship a bunch of BS. I tell my children to think of a couple of simple facts. I have seen stats that show approx. 500,000 slaves were kidnapped to British North America. Approx. 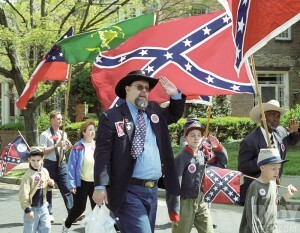 620,000 white men lost there lives during the Civil War and who knows how many civilians. This is profound to me. The United States has paid the ultimate price for slavery but most historians are still stuck on Yankee vs Confederate, Confederate flags and Monuments. Man has been killing and enslaving his brother since Cain and Able. The true miracle of our country is the ability to grow and change over time. Richard, — Thanks for the comment, but we are going to part company on every point you made. Of course kids at that age will believe pretty much anything, but this only suggests that us adults must take more responsibility that the material we introduce is accurate and thought-provoking. History will always be revised so in that sense it is possible that scholars 100 years from now will stare in disbelief at some of our current explanations, but this is true for just about every discipline. Finally, students should take math, science, music, art, history and everything else under the sun. If they don’t do it at an early age when will they be exposed. We have the resources to make sure that they are given a firm foundation in all of these subjects and more if we have a sufficient collective will to do so.